Memorial Day is the weekend that kicks off the summer season, when people plan vacations, camping trips, and time with family and friends. I have numerous memories of good times with my family while on vacations and holidays, some better than others. There is one particular memory of a Memorial Day weekend many years ago while up on our four-acre mountain property at Glacier View Meadows. We went up to enjoy the holiday camping out, cooking our meals over the open fire, all the things that make a great campout. Our youngest daughter was twelve then, and invited a girlfriend along. Our tent was erected, our campsite organized, things unpacked. We had a good fire going roasting our hotdogs and marshmallows under the moonlight. It all started good. “Ah… This is nice.” My husband said, stoking the fire, stuffing marshmallows into his mouth. I agreed. A few hours later when we were ready to turn in and put out the fire it turned colder and dark clouds moved in. The wind picked up and a storm came through. Hunkering down in our tent, we waited and listened as the rain came and the storm blew, pelting our tent, soaking the ground. It was not long before the heavy rain was seeping in getting our sleeping bags wet. I never slept. But, the girls did. How, I did not know. I worried that our tent would float away, or slide downhill on the muddy terrain. The rain continued through the night and into the morning. Dawn came with more gray clouds, more rain, but no sun. “Whoopee!” I said. I needed coffee, strong and hot, a lot of it. We ran to our storage shed to get out of the rain, and hoped it would not float away. But, it was solid and sound, and provided good cover. Our shed though stout and sturdy was built on a gentle slope, with a bit of a slant to one side. It was a building project of my husband’s which he insists was leveled at the time of construction. Our situation made me think about the Bible story of Noah and the Arc. Noah was prepared for the flood. We were not prepared for anything, not even the rain. Noah’s wife must have had a lot of patience. I did not. They were together on that arc for forty days and nights. I could not remain up on our lot for even four days before missing my home. We scrambled our resources, food and cooking utensils. My husband lit the lantern and started the two burner propane stove. I cooked breakfast. Not an easy task. While the coffee perked on one burner, I used the other for the griddle, cooking our breakfast in three courses. The pancakes ran south in the direction of the slope, looking like little oval islands. The egg yolks ran away from the whites and the sausage links, like tiny logs began a downward roll. I caught them before they hit the floor and propped up the stove with a wood wedge. Hungry and cold, we made it work. The hot, fresh coffee and scrambled breakfast revived our cold, tired bodies. The silent prayers revived our adventurous spirit and attitude. After breakfast we wrapped ourselves in coats and blankets hoping for clouds to clear and part. I was soon thankful for our shed. It doesn’t leak and can’t flood, since water won’t settle in one place long before it too runs out on the uneven side. Even the mice come in out of the rain. We survived the rigors of nature, but soon after bought a 25 ft. Airstream 1979 Land Yacht travel trailer for our “get away retreat.” It remains parked beside our shed, even today. Through the years when we all went up to our lot to ‘camp out’ we would still erect the tents for our girls and their families. I and my husband use the trailer, with our dog, except for times when he is feeling like the redneck he is (from Kentucky) and chooses to sleep in the tent, again. 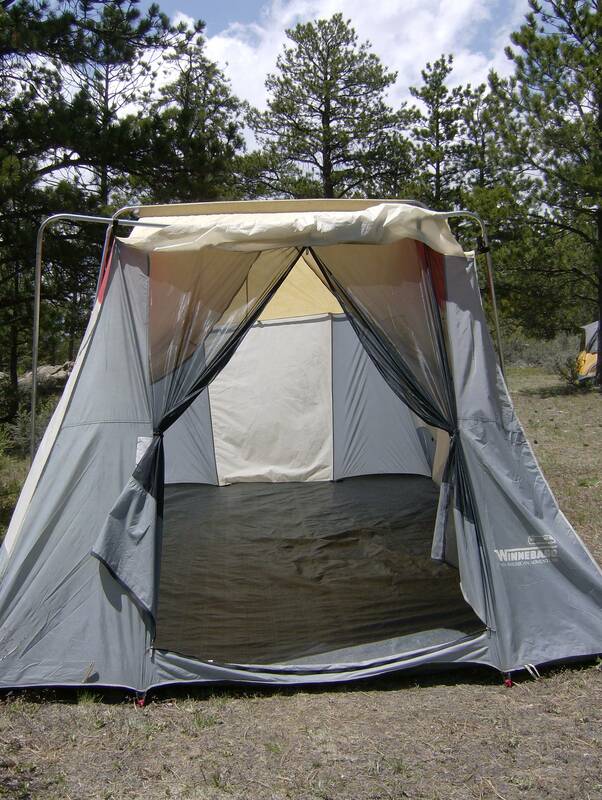 I guess I have grown spoiled, but a few more rugged campouts in a tent on the uneven ground is not very comfortable on joints or settling to jumpy nerves, and does not make for a good night’s sleep. And at times there have been signs and the presence of a rattlesnake, bear, cougar, and coyotes around. The deer, we love and welcome. On holidays we still all congregate around our communal fire pit roasting marshmallows, making s’mores, ‘cowboy coffee’, grilling steaks, burgers and hotdogs. When there is a fire ban in place for the county which is often the case at times during the last few years because of drought and low water levels, we resort to grilling on gas or charcoal grills we keep stored up there. I now laugh at the memory thinking of that weekend up there that Memorial Day, and learned a good lesson. When your together time goes awry, sweeten it with a little laughter, keep your sanity during the adventure, and save the photos and the memory. HAPPY MEMORIAL DAY TO ALL, AND TO ALL A GOOD WEEKEND, IF YOU ARE CAMPING OUT.